Oscar winners, U2 album leaked? On web you can find what you’re looking for. Last August a Dutch fan of U2 walked by Bono’s holiday villa on the French Riviera and heard the singer’s voice booming out of a sound system. So the fan recorded the tunes — tracks from U2’s first album in four years — on his cell phone and posted them online. Problem was, the album wasn’t to be released until this spring; Bono was simply enjoying a private blasting of his new record. U2 managed to get the four songs taken down from YouTube, but then last week perfect digital copies of No Line On the Horizon appeared again on the internet two weeks before hitting online music stores. 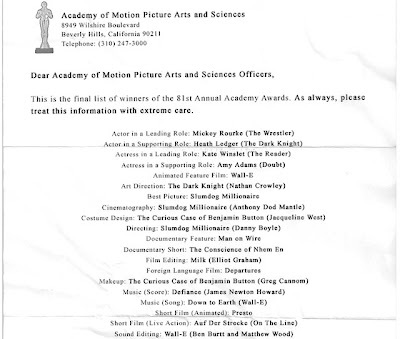 So we weren’t surprised when someone began passing around this memo showing the Academy Award winners before tonight’s broadcast. Who knows if this is a hoax — and that’s part of the point. The new publishing and file-sharing tools are blending reality, opinion, paid sponsorships, untruths and even lies, seeding a thorny mess for content publishers such as awards auditors or rock bands. Chris Anderson has argued for three new “free” business models (best illustrated by David Armano) where producers learn to give more away for free on the front end, to maintain some semblance of control and revenue in the back. In other words, you can’t stop the flow of digitized content to the free. Hey. If Mickey Rourke wins, all bets are off.